For over 25 years, the founders of Global Dairy Solutions (GDS), a design build firm for dairy farms, have offered advanced design and construction services domestically and consulting services worldwide. GDS’s partners are involved in every aspect of building dairy facilities from conceptual design to turnkey development. As the paradigm has shifted in dairy farm operations, dairy cows have moved from being on the pasture to being housed inside large barns which allows for the dairyman to have greater control of his herd. Large barns consisting of a .5/12 pitch sloped sheet metal roof and powered ventilation have been the standard bearer for low-profile cross-ventilated dairy barns until GDS unveiled its patent pending Big Box Dairy® design. Rather than the traditional .5/12 pitched roof, the Big Box Dairy design utilizes a flat, monoslope or single sloping surface roof that serves as an important element in the overall design. A low slope roof barn creates a better internal environment for airflow, cow cooling and cow comfort. The monoslope allows the dairyman to control precipitation runoff on the outside of the facility by providing a way to capture runoff in one central location without crossing potential waste streams where it can be reused on the farm, thus adding a green element to the Big Box Dairy design. 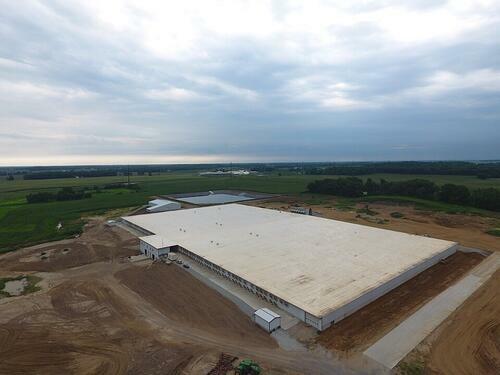 In 2016, Homestead Dairy, located in Plymouth, IN, partnered with GDS to expand its dairy operation by investing in a new facility with state-of-the-art robotic milking technology. As part of GDS’s initiative to offer the best solution in cow housing, it sought out the best possible single-ply membrane roofing system. They looked at several different materials and were very impressed with the longevity and durability of FiberTite®. With unmatched resistance to puncture and wind and lower life cycle costs compared to other roofing materials, GDS chose the FiberTite Roofing System for this installation. This was the first roofing warranty provided to any dairy barn. The 380,000-square-foot facility with 24 fully automated robotic milking machines was completed in May 2017. FiberTite gives Homestead Dairy the peace of mind that their investment will be protected for many years to come. Seaman Corporation, manufacturer of FiberTite Roofing Systems, has been a worldwide market leader of innovative, high-performance coated fabrics since 1949. Using a unique, four-layer technology providing puncture, UV, chemical and ponding water resistance, FiberTite is the original Elvaloy Ketone Ethylene Ester (KEE) membrane with a 35+ year history of performance.